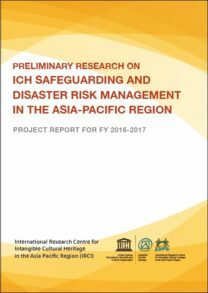 The report of IRCI’s two-year research project, “Preliminary Research on ICH Safeguarding and Disaster Risk Management” (FY 2016- 2017) has been published online. The report consists of three sections: summary of project activities, records of working group sessions held in FY 2016, and case studies assessing the situation of ICH in association with natural disasters that were undertaken in FY 2017 in cooperation with researchers and organisations in Fiji, Myanmar, Philippines, Vanuatu and Viet Nam. The two-years of preliminary research had two major interest areas: 1) understanding the impact of natural hazards and disasters on ICH, and 2) highlighting active roles of ICH for disaster risk management (DRM). It was highly successful thanks to extensive cooperation and collaboration with various researchers and research institutions in the Asia-Pacific region, who were extremely enthusiastic about taking part in the project. It was also our first effort to open up a dialogue between the field of ICH and DRM. These issues will be further discussed at the upcoming ‘Asia-Pacific Regional Workshop on ICH and Natural Disasters’ to be held in Sendai, Japan during 7-9 December 2018. *The full report is available for download if you click the cover image.